CCI is a leading distributor of building control supplies in the North East region. As a leader in the space, CCI allows customers to purchase online as well as via phone and other means. They have a large warehouse which allows them to offer great speed in delivery. They also have a strong customer service and consulting element to help customers choose the right products. 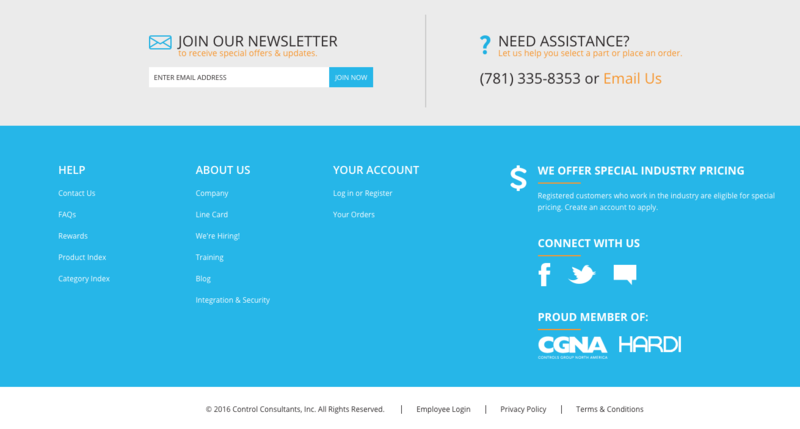 Control Consultants Inc needed a more inviting homepage, better search, and a better menu for finding products faster. They also needed someone to help them grow their customer base as well as convert their existing customer base to use their website more. Their needed a company that could provide true full service, strategy, consulting, design, development, and marketing services at an affordable rate. Trellis redesigned the homepage of CCI to be more inviting and convert more users to sales. We also helped them implement Hubspot and an entire marketing strategy to grow the website on a year over year basis. Trellis now provides full-service support including help with content, SEO, design, development, and much more on a monthly basis.